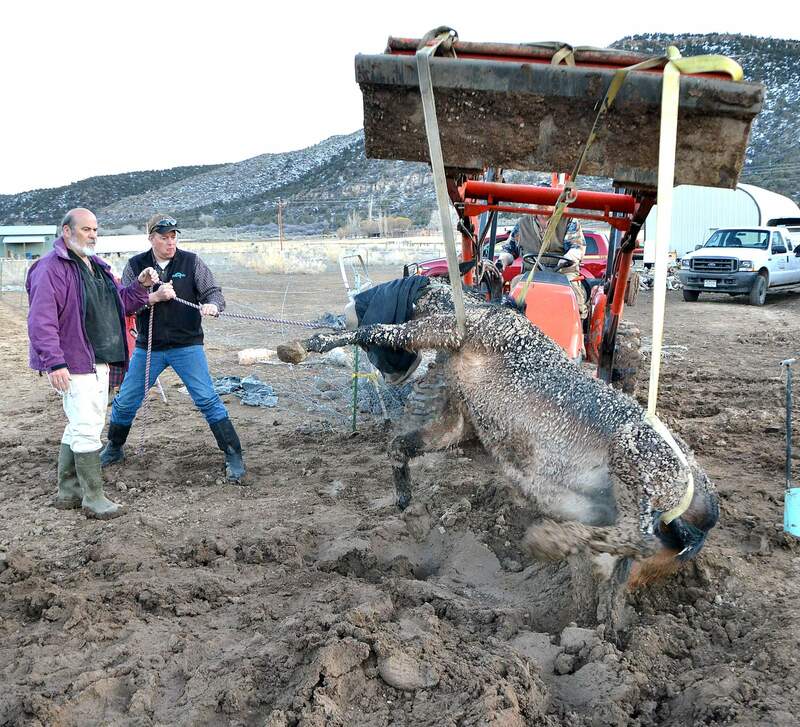 Kelly Ogle and veterinarian Shane Cote try to keep Two Bit Loretta Lou calm as the mule is lifted out of the mud Wednesday afternoon in McElmo Canyon. 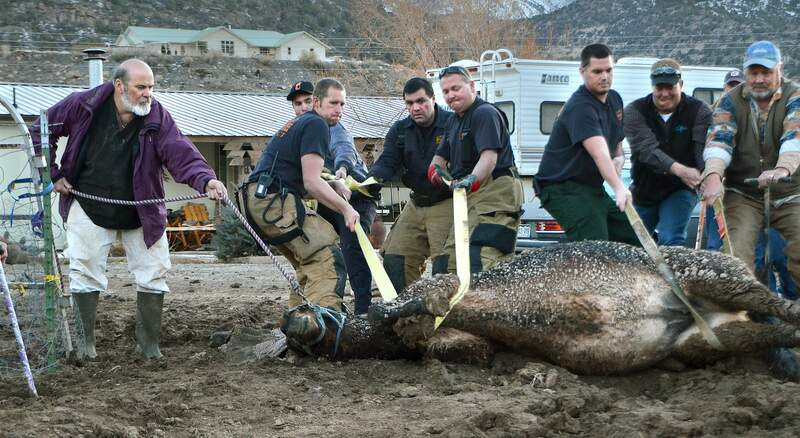 Cortez firefighters roll over Two Bit Loretta Lou after lifting the mule out of a mud hole. Veterinarian Shane Cote of the Montezuma Veterinarian Clinic wanted the mule rolled onto her other side because the animal would be weakest on the side where her legs were stuck in the mud. A relieved Kelly Ogle pets Two Bit Loretta Lou after the mule owned by his mother was rescued. CORTEZ  As patient as a mule? No, thats not the adage, but this mule didnt have a choice. Two Bit Loretta Lou was stuck in a mud hole. 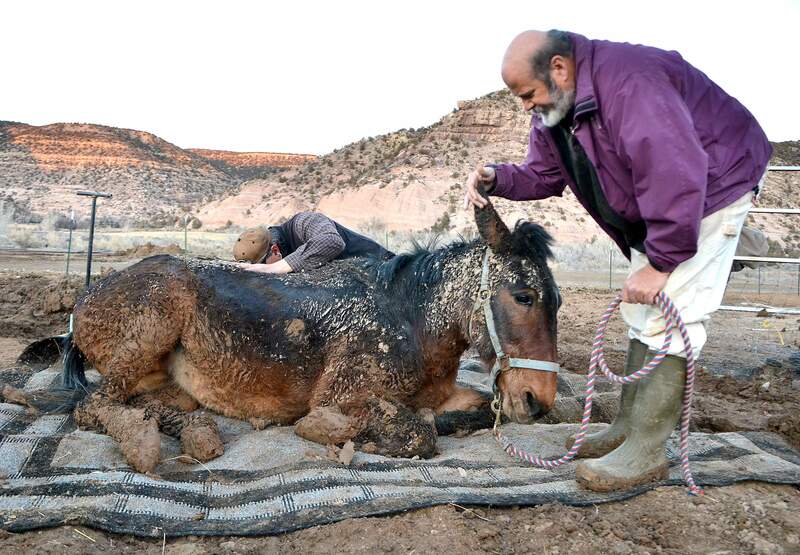 Getting stuck in the mud may not sound like an emergency, but when it comes to horses and mules, it can be a battle for life or death. Wednesday afternoon, however, Two Bit Loretta Lou emerged from the muddy abyss just fine. But it wasnt an easy rescue. I was so relieved, I had tears in my eyes, Shirley Ogle, 83, said about her beloved mule. Shirley and Loretta Lou have been pals for 25 years, so its understandable that seeing that old mule pulled out of the mud was a huge relief. The 30-year-old mule wandered into a mud hole near her corral and, like quicksand, her right-side legs were sucked deep into the muck. The Cortez Fire Protection District responded with six people along with veterinarian Shane Cote of the Montezuma Veterinarian Clinic. With the veterinarian providing the expertise about how to extricate the mule from the mud, the fire crew went to work. A cover was placed over the mules head to try and keep her calm. Then, after digging under the animal, two straps were looped around the mule. A tractor was used to lift her out of the mud and set her down on dry land. Cote has dealt with this type of emergency before, and he knew the mules trapped legs would be weak and fatigued, so he wanted to roll her onto her other side. With eight men  members of the fire crew, Shirleys son, Kelly Ogle, and some neighbors  pulling on straps and Shirley anxiously watching nearby, they gently rolled Loretta Lou onto her other side. Then they waited. When Loretta Lou was rested and ready for this stubborn ordeal to be done with, she pushed herself up. A robust cheer went up from the crowd of rescuers and onlookers. The mule was stuck for at least 1½ hours, Ogle said. When a horse or mule is down and on its side for that long, there are major health risks, plus the possibility of hypothermia setting in. The reason why the tractor with the front-end bucket was on the property was to help fix a water leak, which was what caused the mud hole. Ogle said this was the first time something like this has happened to one of her animals. Ogle checked on her mule before she went to bed, and got up early and visited with Loretta Lou in the morning. Relief and joy were still in her voice Thursday afternoon. Ogles mule was a successful show saddle mule, and the pair competed around California for years. Vandevoorde, who owns two horses of his own, knew the urgency of the situation when they arrived. These animals are a part of the family to many people, he said. He also knows that horses, mules and livestock are essential to the livelihood of many who work the farms and ranches in Montezuma County. When Ogle saw her mule stuck, she immediately called for help, but she knew there was nothing she could do until help arrived. You dont panic, you just have to figure things out and stay calm, she said. Loretta Lou also did her part and didnt panic. Mules are so smart, they wont fight and injure themselves. She was so patient, Ogle said. The old mule fought to try and get loose, but didnt thrash too much, Ogle said. Then she would rest and regain her strength before another attempt. Once crews arrived, Ogle said, her mule seemed to understand that they were there to help her get out. But Vandevoorde said they proceeded with caution when working with the large animal, which weighed more than 500 pounds. The main thing was to help keep our guys safe and also to not injure (the mule), he said. Ogle has lived in McElmo Canyon for four years after moving from California. I came through here 35 years ago and fell in love with the place. It took me another 35 years to move here, she said with a laugh. She and her late husband had another mule that passed away just last fall. Petey was only 27, Ogle said with a laugh. After moving to Cortez four years ago from the Chicago area, Vandevoorde admitted that he hasnt gotten a lot of animal calls in his career. A couple dogs falling through the ice in the winter and one time a bull made a daring escape from the sale barn on Highway 491. This is the first horse call Ive been on, he said. The bull incident didnt turn out well  for the bull. With the brazen bovine on the loose, causing havoc on U.S. Highway 491, the sale barn posse was forced to shoot the animal before it caused a major traffic accident, Vandevoorde said. But pulling a mule out of the muck was a very satisfying day. For Ogle, it was a great day that started out bad but ended perfectly. After spending a good part of the day making sure that Loretta Lou was fully recovered, Ogle could relax. And both she and her mule could get back to enjoying retirement. Shes earned her retirement, Ogle said. Nothing wrong or stubborn about that.